Goal Setting is an important part of the process and kicks off the annual performance / appraisal cycle. In an ideal world the process of setting your goals should be a collaborative process between you and your boss/ manager.This is not always the case and sometimes you need to set them yourself (but don’t be afraid of catching a quite coffee with your boss/manager once you have a list of goals to get their thoughts and to enable them to help you achieve your goals (after all if they don’t know what they are – they can’t offer assistance). Whether writing long or short term goals, the most widely used framework is S-M-A-R-T. Your boss and colleagues will probably already be talking about making sure you set SMART goals – so here is a quick reminder. Specific: Well-defined with specific goals, so that both you and your boss can easily measure progress toward goal completion. Measurable: Provide milestones to track progress and motivate yourself. Attainable: Success needs to be achievable with effort not too high or too low. Relevant: It should be relevant to the companies objectives (not just your own). Time-bound: Establish enough time to achieve the goal, but not too much time to undermine performance. Do your research! If you are not getting your goals handed to you on a plate you should ensure that your goals incorporate both your personal objectives and those of your company. Read your company business plan, do your research, ask the question of your boss to ensure that you are on message. This is particularly important if you are looking to be promoted: make sure you know (and understand) what the promotion criteria are. Once you’ve established your goals, the next step is tracking progress on those goals. If you are serious about taking control of your career you should write a career journal. If you haven’t already got one why not get started with our book PROMPT: 52 prompts for setting up and writing your career journal. It’s important to track your progress on goals because you will need to have the information available during the all-important review process. This is why we’ve created the Career Progression Goals and Meetings Notebook which has a focus on setting goals, developing an action plan and tracking your progress as well as one handy place to prepare for and keep a record of career related meetings, your achievements, training and of course that all important appraisal / review meeting. The notebook can be used with or without a career journal. Our Kickstarter campaign for the Career Progression Goals and Meetings Notebook is currently live and closes at the end of the month. Grab a copy of your notebook now by supporting our campaign. Z is for… Are you sure you want this job – you may be bored? In a job market where jobs are scarce it is often the case that a candidate is applying for job that they are overqualified for. If the interviewer feels that you are overqualified for the job they may feel reluctant to hire you as they may be worried you will move on in a few months. If you get asked you need to be able to convince the interviewer that you want the job, that you will work hard and you will not get bored. Even better you may be able to convince them that you love doing this type of work. Keep the emphasis on the positive. This is a question that can easily be prepared as you will already know whether you are overqualified for the job. You may already be worried that you may get bored on the job. Work out your strategy in advance. Using your career journal will help you find inspiration for Interview Questions and help you prepare, practice and review your answers. This can be a great technique which is why I have chosen to use the A to Z of Interview Questions Posts as Journal Prompts. If you don’t already have a career journal this is the perfect excuse to get started. Y is for… How would you describe YOURSELF? I have already asked how your boss or colleague would describe you, but what if you got asked how you would describe yourself – do you know what you would say? Sometimes the interviewer might limit this to three words, or even one word. I start preparing for this question by writing a list of words I use to describe myself. I then remove all those words that are not professional. I then re-read the company’s values, vision and current employee profiles to see what matches up. I then expand on this words so I know why I would use these words why they describe me and prepare a couple of statements that could be used in an interview context. These ‘example’ questions are quite frequently also behavioural questions and should be answered using the STAR method. However, you might also be asked more of a skilled-based question. You should have an example to back up all of your skills and experience. A technique I find useful when preparing a CV that is tailored to a job description is to also note an example at the same time. Your Career Journal should be FULL of examples ready to answer any question you may get at interview. W is for… What is your greatest Weakness? Usually you will either get asked about your strengths or your weaknesses (or maybe both). It is important to be realistic – you are human. You will have a weakness. You could pick a skill that you consider a weakness which is not essential to doing the job and balance it with other skills. Or you could pick a weakness that you have can demonstrate that you have improved. However, it is important to show how you overcome (or are going to overcome) the Weakness when answering this question. The best way to prep for this question is to actually know what your weaknesses are. Write a journal entry setting out what your weaknesses are. be honest – this is not what you are going to say in your interview. Once YOU know what your weaknesses are you can then think ahead and make an action plan in your career development goals notebook to improve and overcome your weakness. 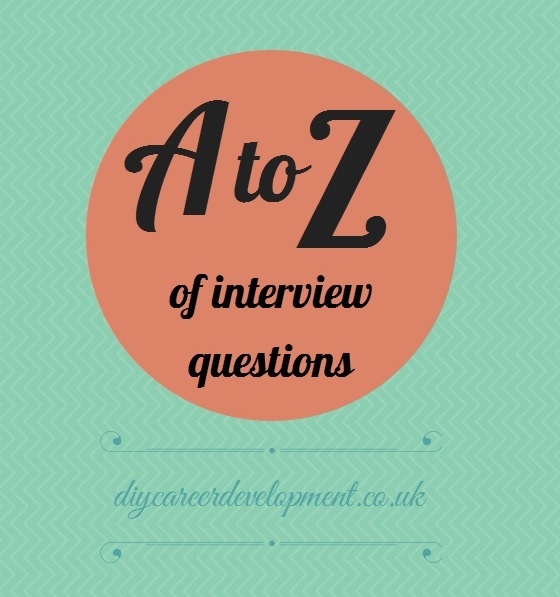 An appropriate weakness can then later be formulated into an answer to this interview question. V is for… how will you add VALUE? To answer this question you will need to think about both your skills and what the company needs/wants and how you will actually fit in. Elements of this answer may come from why you want to work for the company and why they should hire you – but it needs something more than this. The more specific you can be the better! You should be able to work out from the interviewers perspective why you are a good investment. An example of an exercise you can do to help is to work out your value is work out your value for your current job. How did you add value? Next look at the mission statement, goals or business plan for the company you are interviewing for. What areas can you contribute to? What value you can you add? U is for… Why did you choose your University? This question is a popular question for graduates. Recent Graduates (or final year student interviewing for their first job) will have a less ‘on the job’ questions that they can answer so interviewers may ask why they chose a particular university to do their undergrad or postgrad degree. This will be a mix of general interest, understanding a change in geographical location and also gives the candidate an opportunity to demonstrate decision-making skills.